NEW YORK -- Spencer Dinwiddie and the Brooklyn Nets keep adding to a big week. A later report said the deal had fallen through, but that was after Rivers -- who wasn't aware of all the details -- believed he was departing. He said he was disappointed in part because he had just moved after being dealt from the Clippers to the Wizards over the summer. "More so you just want things to work," he said. "When I got traded, they traded for me for a reason so you'd like to see it work out." "It was nice to see him after everything that's happened. I thought he took it to another level, defensively and offensively," Nets coach Kenny Atkinson said. "He was outstanding all around. You definitely see the growth, the maturity and quite honestly leadership capabilities. He's getting better every day." Joe Harris added 19 points for the Nets, who put up a season-high 70 points in the first half but had to withstand Washington's fourth-quarter charge. Dinwiddie halted the Wizards' run with a basket and some free throws, and Harris added some clutch baskets down the stretch as the Nets held on to remain unbeaten since a players-only film session after a collapse and loss to Oklahoma City on Dec. 5. "Now we're kind of rolling a little bit," Dinwiddie said. "Let's keep it going. Let's never get too high or too low." His layup with 42 seconds left was the last basket of the third quarter and gave the Nets their largest lead of the game at 101-85. The Wizards cut it to four a few times, the last when Beal's basket with 4 1/2 minutes left made it 113-109, but the Nets scored nine straight to push the lead back to 13. "The defense just isn't there," Beal said. "We weren't guarding." Washington held the Nets to a season-low 88 points in a Dec. 1 home victory but couldn't slow them down this time. The Nets scored 43 points in the second quarter and led 70-59 at halftime. They were 5 of 7 from 3-point range in the period. The Nets held a moment of silence before the game for Tim Bassett, who died Sunday at 67. Bassett played from the Nets from 1975-79, winning an ABA championship in 1976 and serving as the team's captain when they moved to the NBA and New Jersey. "I don't see why he can't keep trending upwards," Atkinson said. "He's got all the tools." 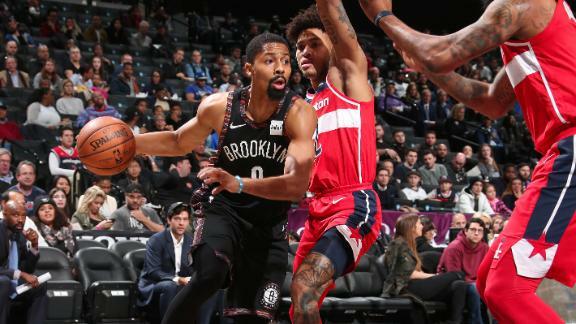 Spencer Dinwiddie has 27 points and 6 assists as the Nets defeat the Wizards to win their fourth straight game.